Flying into a Baltimore or Washington D.C. airport for your cruise? Or maybe you simply don’t want to deal with the headache and expense of dealing with parking your car. Or perhaps you are taking the train into the area and need to know how to get to the port. No matter the reason, if you’re needing transportation from anywhere in the area to your cruise ship, then we have you covered. The good news is that in a city with a mature transportation network like Baltimore, you have a number of options in getting to the port. And depending on your budget, they run from relatively cheap to super stylish (and more expensive). Below, we take you through all the options on getting to the Baltimore cruise port, so you can find the right mode of transportation for your situation. As for a mix of cost and convenience, we think rideshare services win hands-down in getting from anywhere in the area to the port. From your phone you can call a ride on demand, no matter where you are. As well, rates are extremely affordable. When you mix a ride anytime you want with a cheap price (remember, up to four people can ride with no increase in charges), we think taking an Uber or Lyft to the ship makes the most sense for most people. Here are some example estimated rates you would pay for getting to the terminal. Note that that taxi rates include a 15% customary tip. Uber doesn’t use tipping. Lyft makes tipping optional. For more on using rideshare services to the cruise port, see our write-up here. If you don’t want to use rideshare services like Uber/Lyft, you can always take a cab from the airport or anywhere else around town. Expect the rates to be a little more expensive, but still reasonable and convenient for getting to the port. Keep in mind that if you are coming directly from an area airport, you shouldn’t have to wait long to catch a taxi. If you are at a hotel or some other location in the area, you’ll want to call a cab in advance to give it time to come reach you before. Both Royal Caribbean and Carnival offer shuttles from the Baltimore airport (BWI) to the cruise port. For example, Carnival charges $25 per person each way for their shuttle. This service will meet you at the port to pick you up on cruise day and deliver you right to the port. For a couple of reasons, we usually suggest going with another option than a cruise shuttle transfer. First, it is expensive. The rates shown above are per person. So a family of four is paying $25 each ($100) just to get from the airport to the cruise port. Other options like Uber and taxis usually price based on the car, not the number of occupants. Second, cruise transfers are extremely limited. In this case, it runs only from the airport to the terminal, and only on the day of sailing. So if you come in early or are staying at a hotel in the area, then the cruise line transfer isn’t a viable option. 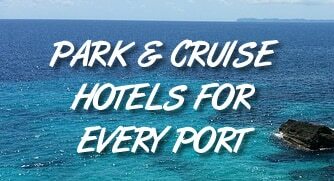 If you decide anyway that you would prefer a cruise line transfer, simply contact your cruise company directly to book a reservation. If you are traveling with a larger group or want to ride to your cruise in style, then your best bet is likely to look for an independent shuttle van or private car service. These providers can offer private service to the port, usually for less per person than a taxi or other service, assuming you have five or more passengers. They can also give you a ride in an upscale car or even a limousine. To be frank, the number of shuttles and car services in the area is extremely high. That means we can’t list them all here. Instead, we’ve rounded up a sample list of area companies to give you a good start to go from. If you are headed to Baltimore via train, the odds are likely that you will arrive via Baltimore Penn Station — the primary station in the city. Penn Station is only about four miles from the cruise terminal, or a 15 minute car ride. We recommend taking either Uber/Lyft or a taxi from the train station to the port, once you arrive. Public transit to the port isn’t convenient, especially considering you will be carrying your luggage. Getting to the port via public transportation involves catching the Purple route aboard the free Charm City Circulator outside of Penn Station, before transferring to the Banner route. Once on the Banner route, you’ll get off at the stop located at Fort Ave. & Lawrence St. From here, it’s about a 20 minute walk south to the port. Instead of worrying about unfamiliar public transportation routes, it’s just a few dollars to take a car to the port. As mentioned above, we highly recommend taking a car over using public transit to the cruise terminal. The problem is that getting to the terminal typically involves one or more transfers, plus at least a 20 minute walk from the closest bus stop to the cruise terminal. That means what can be a 15 minute car ride turns into an hour-long commute. Just pay a few bucks for a cab or car, and start your trip off that much easier! If you are a first time rider with Lyft, visit this link to download the app and receive FREE ride credit for your first ride.